workpiece, or taking long time in grinding. ・adhesives’ run out or taking time in adhesion. size cannot be measured accurately. Porous grinding stone easily lets the heat go and grinds more tiles at one time, compared to conventional grinding stones. The newly developed bond gives the product excellent touch of grinding. 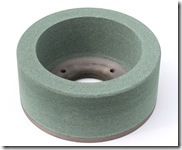 Double-layered grinding stone makes the works of φ405 anda one-stone grind machine more efficient.